Take Action | Human Rights First Tell President Obama: Support Democracy and Civilian Rule in Egypt! 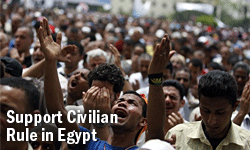 Tell President Obama: Support Democracy and Civilian Rule in Egypt! In January 2011, the people of Egypt took to the streets and brought down the thirty-year reign of Hosni Mubarak. Next week will mark the anniversary of the protests in Tahrir Square but, while Mubarak is gone, his military and much of his regime still rule the country. On Tuesday, when President Obama delivers the State of the Union address, he should make clear to Americans and our allies throughout the Middle East and the world that the United States supports civilian, democratic rule in Egypt. And that the country stands with all those who struggle for human rights and democracy. Ask President Obama to state his support for a democratic Egypt in next week's State of the Union address. Tell him to support civilian rule in Egypt!